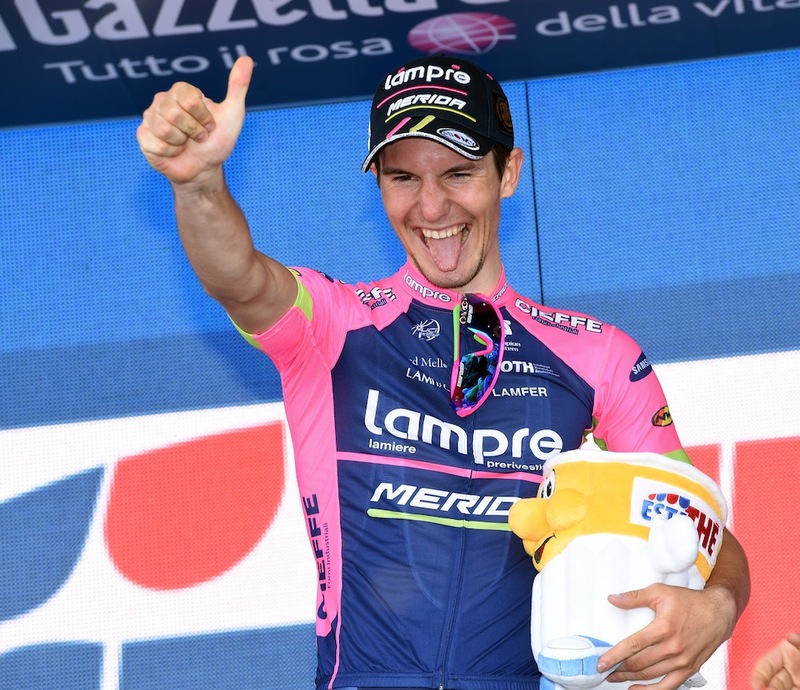 Jan Polanc (Lampre-Merida) took an impressive solo victory on the summit finish to Abetone on stage five of the Giro d’Italia, as Alberto Contador (Tinkoff-Saxo) took the maglia rosa by two seconds over Fabio Aru (Astana). Polanc has been part of the day’s main breakaway, which formed within the first 20km of the race. The Slovenian was joined by Silvan Dillier (BMC), Sylvain Chavanel (IAM Cycling), Axel Domont (Ag2r-La Mondiale) and Serghei Tvetcov (Androni Giocattoli – Sidermec), who together amassed a gap of over 10 minutes before the peloton began to turn things on and cut the time gap. But the lead group managed to make it to the foot of the 17.3km mountain with over four minutes on the peloton, with an attack coming in the first 2km of the climb from Chavanel. Tvetcov was instantly dropped, but the Frenchman was unable to lose his other breakaway colleagues, and before too long, Polanc launched his attack with just over 10km to go. There was little the others of the break could do and the 23-year-old was able to reach the finish with over a minute-and-a-half on the chasing GC contenders, whose battle had heated up behind, to take his first Grand Tour stage victory. Astana, much like Tuesday’s stage four, were the main instigators in turning up the pace on the final climb, with Tinkoff-Saxo attempting to match them. It meant, that the bunch began to split, with race leader Simon Clarke (Orica-GreenEdge) suffering and unable to hold the pace. It was Contador who attacked first, with around 4.5km to go on the climb, but his nearest rivals, Aru and Richie Porte (Team Sky) gave him no rope and stuck to the wheel of the Spaniard. Porte was next to try a move, befor Aru took his turn, but no-one was able to establish a clear gap on their fellow overall contenders. Mikel Landa (Astana) managed to make his way from the main group behind over to his team leader Aru, and began to turn the screw to help drop Porte and Contador. 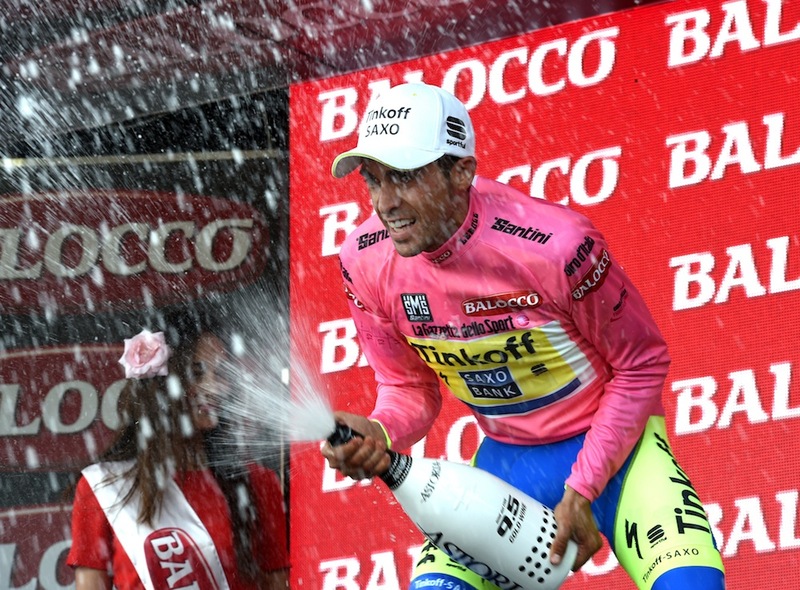 In the end, the three rivals came into the finish together just behind Chavanel, with Aru crossing the line in third to take a six second time bonus, but Contador did enough to take the pink jersey. The day’s biggest loser was Rigoberto Uran (Etixx – Quick-Step), who after losing time on Tuesday, finished almost 30 seconds down on Contador on the day and now sits 1-22 down in GC. Thursday’s 183km stage six looks destined to end in a bunch sprint. With a category four climb within the first half of the race, there’s a flat and fast finish which the sprinters will be relishing and the GC riders will look to navigate safely.